Showing concurrently in our project room will be ‘Nothing Lasts Forever’, featuring new charcoal works on paper alongside a series of new oil paintings from Stephanie Buer in her debut solo exhibition with our gallery. 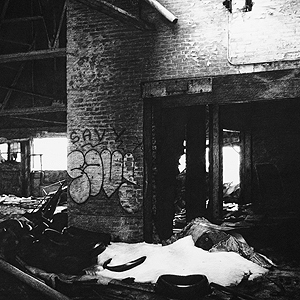 Stephanie Buer began pursing a career in art at the College for Creative Studies in Detroit, Michigan where she fell in love with the city and urban exploration. She spent the next ten years living in Detroit and developing as an artist. Her urban landscapes explore the many layers of history found in the marginal areas of cities. From the imprints of industry and production to its eventual decay, each subject has a historical context, an original purpose that is now lost. She is fascinated by how these places change as they succumb to the manipulation of vandals, artists and the resilience of nature ever slowly growing alongside. Through her art Stephanie seeks to find beauty and peace in these forgotten and unloved areas of cities. She currently works in Portland, Oregon at her studio in the Falcon Art Community.